It has been over a year now that Barack Obama was elected President in a convincing victory over moderate Republican John McCain. President Obama was the first Democrat to get more than 50% of the vote since Jimmy Carter did so (barely) in 1976. So a year later, what does this election mean for the conservative movement? I am convinced that McCain's loss was good for the conservative movement. We have an energized conservative base that is motivated to oppose Obama's policies. It started with the tea parties in the spring and moved on to the town hall meetings over the summer. Conservatives are energized and motivated to get conservative Republicans elected in 2010. That simply would not have happened with John McCain, who would have continued the same old big-government policies of George W. Bush. We would have had amnesty for illegal aliens and more campaign-finance "reform." 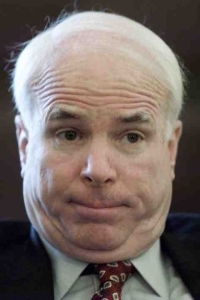 McCain would be advocating his own health care "reform" proposal that would not have been as dramatic as what Obama is proposing now but would nonetheless significantly increase the federal government's control over health care. We would have had an economic stimulus that focuses on government spending rather than tax cuts and more bailouts, again not as comprehensive as what Obama has done but we would still be moving in the wrong direction. In short, McCain would have continued to be "Democrat Lite" and discouraged conservative voters. Not having McCain in the White House allows conservatives to contrast themselves with a Democratic administration that is seeking more government control with each policy it proposes. McCain's loss has allowed conservatives to redefine ourselves and go back to our roots as opponents of big government and supporters of lower taxes, smaller government and more individual liberty. Had McCain won, conservatives would be pressured to be loyal to the "Republican" President and would not be nearly as energized to oppose his policies. Note that I've used the word conservative as opposed to the word Republican. This is because while Obama's victory has energized the conservative movement, the Republican Party (other than a few outspoken conservatives like Sarah Palin, Michelle Bachmann, Mike Pence and Rush Limbaugh) has been slow to recognize the increased enthusiasm of the conservative base and the increasing number of people who identify themselves as conservatives. The GOP establishment proved it still does not "get it" by supporting Leftist RINO Dede Scozzafava in New York's 23rd District. Ultimately, an energized conservative base will be good for the Republican Party as conservatives work to take back the GOP from the country club Republicans and "moderates" who have driven the party into the ground over the last four years. Once that happens, Republicans can shake the reputation as the party of big government and contrast themselves with Obama by presenting a clear agenda of limited government, individual liberty, protecting all innocent human life and defending marriage as an institution of one man and one woman. This energy simply would not be there had we elected a RINO like McCain. Will Republicans learn the lessons of 2006 and 2008? For the sake of the country, I hope so.